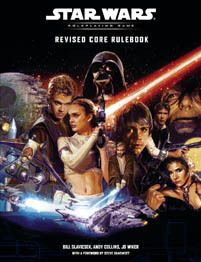 "Masquerade" is a Star Wars Roleplaying Game mini-adventure for four heroes of 7th to 9th level. In this scenario, the characters must attend a famous annual masquerade party aboard a luxury space yacht, where they'll mingle with the costumed guests and ferret out the villains who've kidnapped the host's daughter. You will need Adobe Acrobat® Reader® 5.1 to view this file. Download it here. Did you ever wonder why your mother always warned you not to wear your jump boots in the house? Designer JD Wiker answers this and many other quandaries in the latest installment of "Jedi Counseling!"